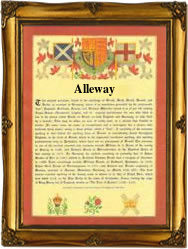 This interesting surname, with variant spellings Allaway, Aloway, Alway, Alaway, Allawy, Alleway, Elloway and Halloway, has two possible sources. Firstly, it may be of Scottish locational origin from any of several places called Alloway, Alloa or Alva, for example, Alloway in the former county of Aysshire, all deriving from the Gaelic "allmhagh" meaning "rocky plain". Secondly, it may be of Anglo-Saxon origin, derived from the Olde English pre 7th Century personal name "Aethelwig", composed of the elements "oethel" meaning "noble", plus "wig", battle. The surname dates back to the early 13th Century (see below), and further early recordings include one Richard Aawy (1260) in the "Eynsham Cartulary". Recordings from London Church Registers include: the marriage of John Allowaye and Margaret Langshawe on June 20th 1587, at St. Michael's, Bassishaw, and the christening of David Allaway on November 12th 1637, at St. Margaret's, Westminster. A Coat of Arms granted to an Allaway family is a shield divided by a bend blue and black, three boars' heads couped between two silver six pointed stars; the Crest being two black anchors crossed and on top is of a dove holding in its beak an olive branch in their natural colours. The Motto, "Dei Dono sum quod sum", translates as, "By the bounty of God I am what I am". The first recorded spelling of the family name is shown to be that of Roger Alewy, which was dated 1200, in the "Pipe Rolls of Middlesex", during the reign of King John, known as "Lackland", 1198 - 1216. Surnames became necessary when governments introduced personal taxation. In England this was known as Poll Tax. Throughout the centuries, surnames in every country have continued to "develop" often leading to astonishing variants of the original spelling.